The Kingdom of Dahomey (present-day Benin) was a flourishing region since the end of the 15th century. The rulers of Dahomey sold their captivities to the Portuguese merchants, that led to the area being named “the Slave Coast”. After abolishment of slavery the kingdom gradually started to lose its status of regional powerful territory, that enabled the French to set their administration there in 1892. In 1899 France included French Dahomey to the French West Africa colony. Dahomey gained status of overseas territory of France in 1946, after the end of World War II. In 1958 France granted it autonomy, and the territory was named the Republic of Dahomey. Full independence was achieved on August 1, 1960, Hubert Maga became the first president of the Republic of Dahomey. The next 14 years of independence were the period of political instability. Four major figures dominated the region, that accompanied several coups. 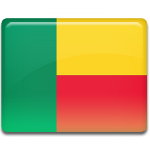 In 1975 the country was renamed to the People's Republic of Benin.